[miningmx.com] – THE Association of Mineworkers and Construction Union (AMCU) rejected an ultimatum from platinum producers to return to wage talks, said BDLive citing the union’s president, Joseph Mathunjwa. The publication, quoting Mathunjwa at a press conference today, said platinum firms were attempting to steal the moral high ground. 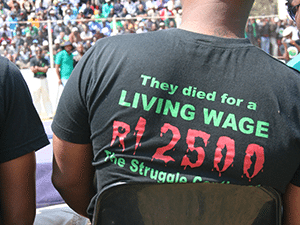 The union would continue wage talks until reaching a settlement that “accommodated our R12,500 demand,” Mathunjwa is quoted to have said. BDLive said Mathunjwa wanted the CEOs of the mining companies – Anglo American Platinum, Lonmin and Impala Platinum – to participate in wage talks. The companies said yesterday that failing to end the strike would lead to more job losses in the sector.